and other shooting sports where a lead bullet is desired. 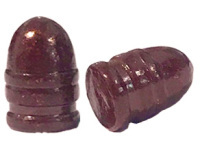 Cowboy Bullets: These bullets are great for Cowboy Action shooting. 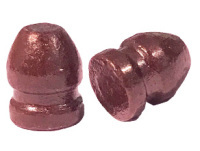 Revolver Bullets: These bullets are recommended for double-action revolvers using moon clips or speed loaders because they have profiles that make for easy speedloads. 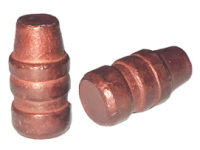 Brinell Hardness: All bullets have a Brinell hardness of 12. They are great for velocities of 800-1000 fps. Not recommended for velocities over 1300 fps. Sized & Lubed: All bullets are sized and lubed with Magma Lube Blue bullet lube from Magma Engineering. 1 Box (500 bullets): Is shipped via USPS Priority Mail Flat Rate Padded Envelope @ $7.00. 2 to 4 Boxes (1000 to 2000 bullets): Are shipped in a USPS Priority Mail Flat Rate Box @ $13.00. † Shipping is added automatically when you click on "Add to Cart". ✗ Do NOT change the quantity while in the Shopping Cart. Return to this page to add more bullets. ✓ When Ordering only bullets, please select USPS as the shipping method at checkout. 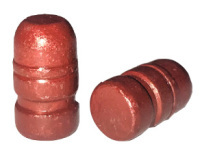 ✓ All bullets are drop-shipped directly from the manufacturer in New Mexico. The Bang and Clang logo is a trademark of Bang and Clang LLC. I was first introduced to the original Bang N Clang Bullets in Magdalena, NM about ten years ago. The proprietor, Steve Pawlcyn, convinced me that his softer bullets were what I needed for Cowboy Action Shooting. One, they completely filled the lands and grooves in the barrel, and two, they held a crimp much better than harder bullets. 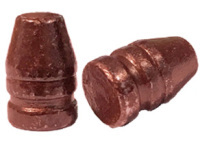 Many Cowboy Action Shooters use .38 spl ammunition in both their rifle and pistols, and with a straight walled case like the .38, a solid crimp is imperative. The biggest testimony to the quality of a product is where and how often it gets used. Bang N Clang Bullets are sold and used by Cowboy Action Shooters across this country! In the past, I have hauled as many as 56,000 bullets to Winter Range to deliver to shooters who pre-ordered them. These bullets work! The new proprietor, George Martin of Bang and Clang Bullets is using the same exact recipes and molds used by Steve Pawlcyn. 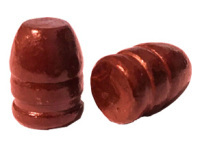 Now producing coated bullets as well, shooters around the country are thrilled to be back using a product they know and trust.